A popular chat and social networking site with an international following. Badoo is for anyone looking for new friends, or a romance. There are plenty of features to help you connect with other people both locally and beyond. Badoo is a bit like Facebook meets dating. Basic membership is free, however the site offers an upgrade to super power or VIP status that will give you extra privileges such as seeing who's interested in you. Badoo is a massive social dating site for meeting new friends and keeping in touch with existing ones. You can search for people meeting your preferences. For example if you're looking for a date, to go out for a coffee with someone, or just for someone to chat with online, choose the appropriate option and you'll be shown a list of suitable people. You can even install a handy desktop toolbar that will show you whether someone is nearby. Apps are provided too for mobiles. The whole experience is designed to be as simple as possible. For example, "encounters" is an addictive pastime. It will show you pictures of other members - the gender you've chosen and you just say if you like them or not. That's as far as the matching goes on Badoo. Oh and you won't be able to interact or do much until you upload your own photo. Credits let you buy popularity and increase the number of encounters. While much of the site is free, in order to be visible, you need to increase your popularity. Initially this is done by fully completing your profile, and adding at least one photo. But if you don't add credits to top up your account, you could be confined to the wilderness. If you're using the app or on your phone, you can check out nearby people. This will tell you who's in your area, or possibly in the same bar or coffee shop. 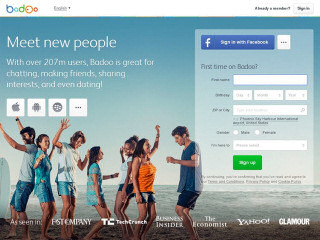 In summary, Badoo offers an experience very similar to other social sites like Facebook, Person and MySpace. The attractive layout, useful features and easy navigation will appeal to many people. You won't be able to interact or do much until you upload your own photo. Rss Feeds. Subscribe to comments for this site. [?] Receive updates about Badoo.com directly through your newsreader. I am interested in meeting beautiful lady. serious interests only. Badoo 4 1 A review of Badoo. A popular chat and social networking site with an international following. Badoo is for anyone looking for new friends, or a romance. There are plenty of features to help you connect with other people both locally and beyond.